An outing by 11 members of the PWay gang to the NYMR, to be completed uniquely by train. Would we make it all the way? We set off in three groups, depending on where we lived (on the Gloucester-Birmingham axis essentially). This meant separate ticketing, and different travel arrangements, so that, surprisingly, we did not end up on the same train after Birmingham, except for the last stretch into Whitby. 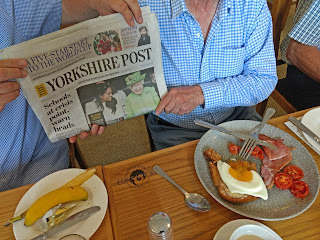 Yours truly was with Robert and Peter on a cross country train to Darlington. 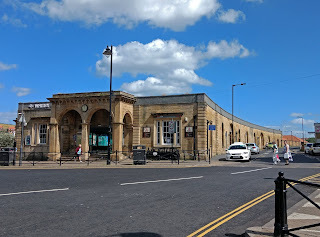 We had a 5 minute changeover there for a train to Middlesborough, from where our tickets took us on a third train down the Esk valley line to Whitby. Now some blog readers earlier doubted the feasibility of a 5 minute changeover at Darlington. These doubts, it soon appeared, were well grounded as our train was held for 2 vital minutes outside Doncaster. As we neared Darlington and stood in the doorway armed and ready for our cross platform dash, Robert began to lower our chances of catching the Middlesborough train from a still hopeful '40 per cent chance' to a somewhat resigned '20 per cent chance' when a fellow traveller, armed with a Northern Rail app, helpfully announced that it had just left. Alas, it was all true. It dawned on us that our brief pause outside the station was to let the Northern Rail train out. Hot damn! Don't these people talk to each other? 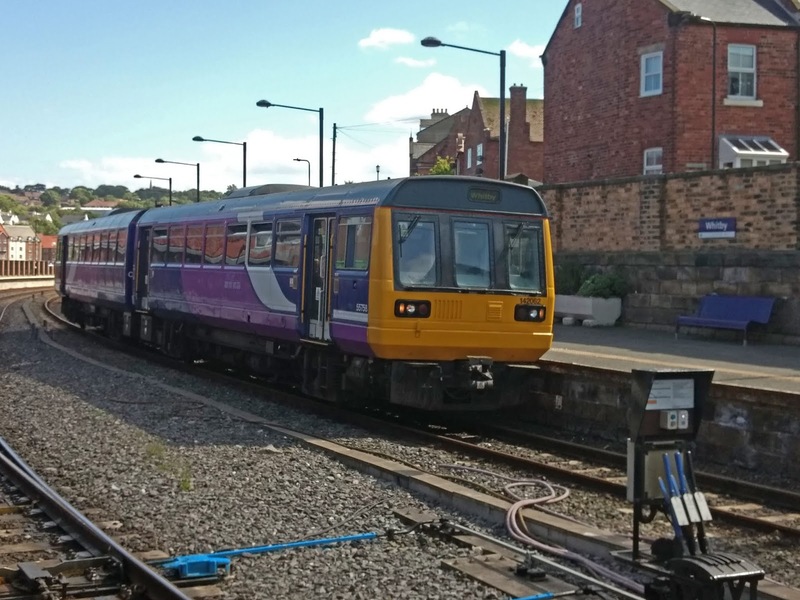 After 20 minutes another Northern rail train to Middlesborough duly appeared, but a hasty calculation revealed that it would arrive there too late to catch the Whitby train. We boarded the Sprinter, a DMU with bus seats that was rather better than often described in the press. We bowled along merrily, passing a famous swing bridge and another with a traverser under it. 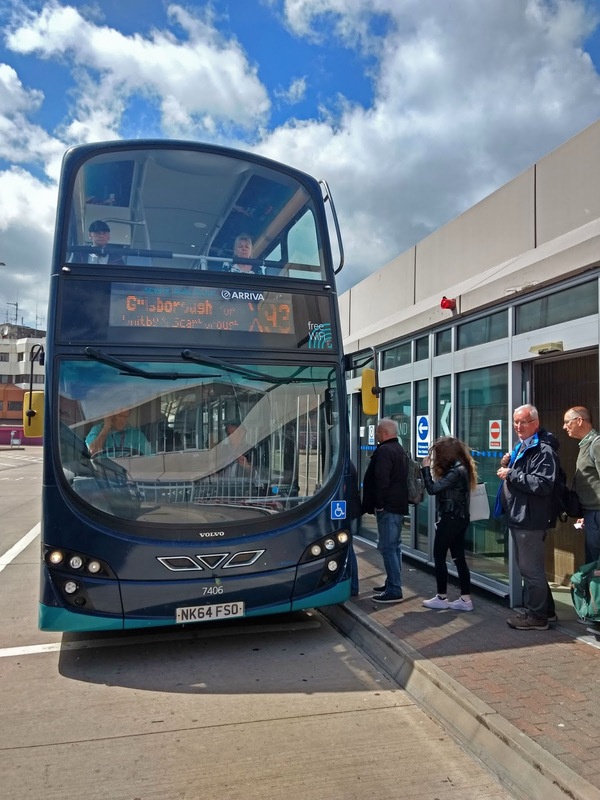 Our plan B at Middlesborough, after a failed 5 minute connection at Darlington, was (don't say it too loudly) to catch a bus to Whitby. A bus! Yes, here are two PWay gang members, now in civvies, about to board a double decker to conclude our railway trip to Whitby by road. This after a breathless dash across town, as the bus terminal was nowhere near the railway station, but a good 15 minute gallop along the streets with little or no signposting from one to the other. Fortunately Robert had done his homework, but what would Joe Ordinary Public have done? And so it was that group one, ex Birmingham new street railway station, arrived at Whitby station - by road. Our first glimpse of it therefore was from the outside. 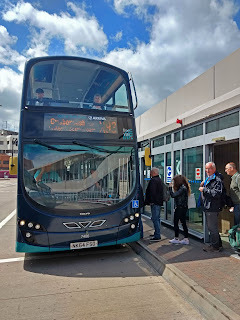 We allowed ourselves a victorious chuckle though, as although group 2 travelling via York had indeed caught their Esk valley line train, we beat them to Whitby by 5 minutes with our double decker bus. Hah ! 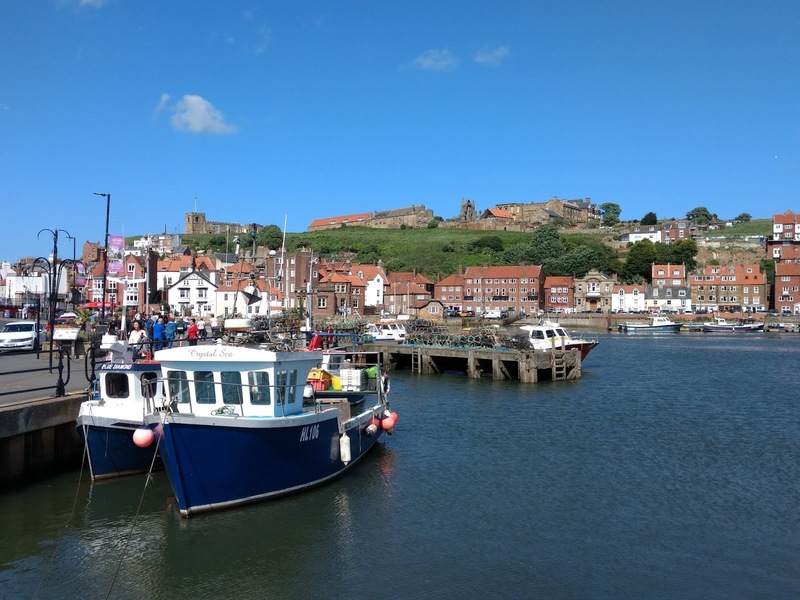 Whitby is a pretty town, and we even had 5 minutes to look into the harbour before making for the station to greet the others arriving from Middlesborough by train. 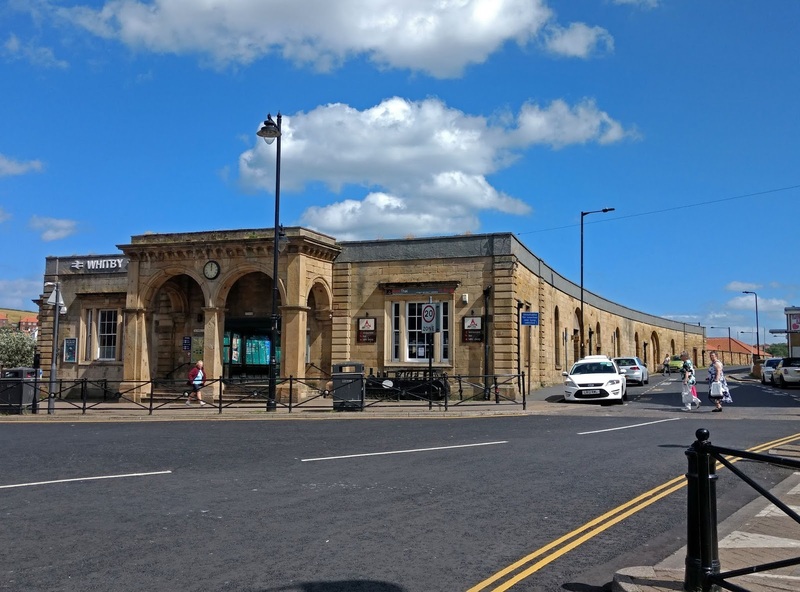 Inside Whitby station, Robert stood leaning against a railing and greeted group 2 with an air of practiced nonchalance. John R, orange bag, just couldn't believe it. 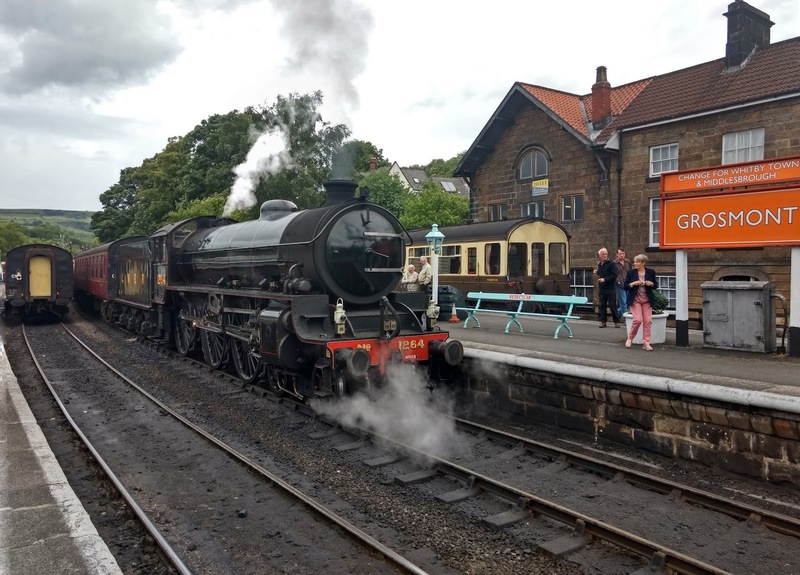 Group 3 consisted of Dave P, travelling solo, who had decided to attack the NYMR from the rear, arriving in a surprise move at Pickering instead. 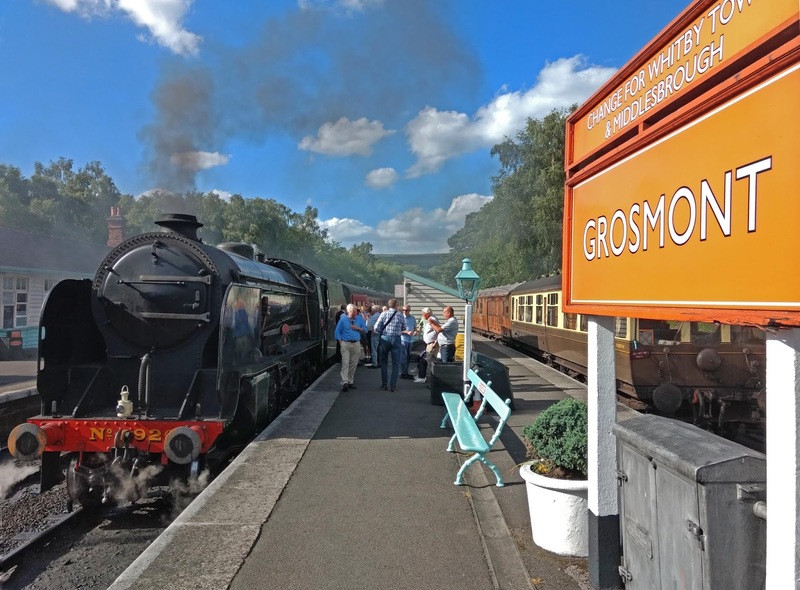 He then took a NYMR train north, and we met at Grosmont. 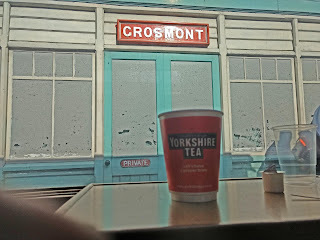 Grosmont was in Yorkshire, as we soon found out. Proud people there. A proud passenger in the train firmly but helpfully pointed out our mispronunciation of not only Slaithwaite, but also Standedge and Bury. Ouch ! Our loco for the day was Schools class No. 926 REPTON, a 4-4-0 built by the Southern Railway. Would it be suitable for the steep 1 in 49 climb with a 7 coach train? The loco crew were cheerful and competent, as we tackled the climb steadily, with just a brief slip as we pulled away, uphill round a curve, from a slack inconveniently situated at the bottom of the steepest part. The Schools class was the most powerful 4-4-0 ever built in Britain, and handled the steep gradients and many curves of the NYMR in fine style. Here it is on arrival at Pickering, another station with a fine, reinstated heritage roof. It had great atmosphere. John M had got us a great deal in a local pub with dinner, bed and breakfast for all 11 of us. We stayed at the Black Swan, a 1740 coaching inn with its own micro brewery. This pleased several of us, and we felt it downright impolite not to sample the local brew extensively. 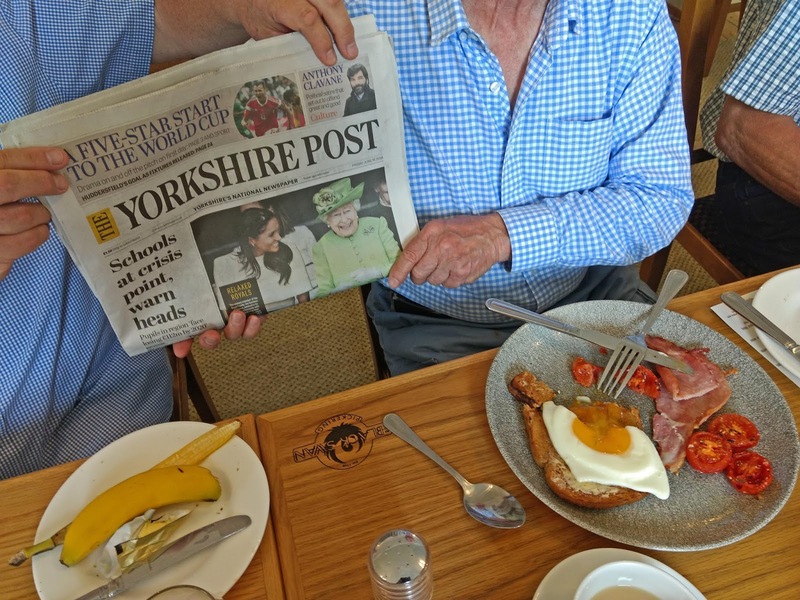 Breakfast had choice of healthy (L) and less healthy (R) but in any case it was clear where we were: Yorkshire! An offering of black pudding by the waitress was politely declined. 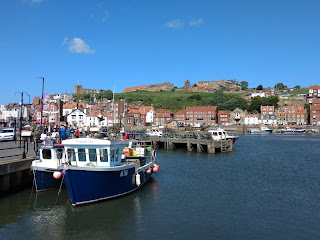 This next day we were due to return home, again by train, but not before a full return trip to Whitby. It was ambitious, but as it proved, perfectly do-able. 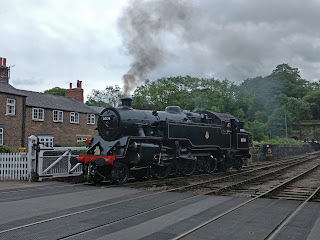 REPTON took us north again, with one party continuing to Whitby and the other alighting at Grosmont for a good poke round this interesting junction, and a look round the shed. 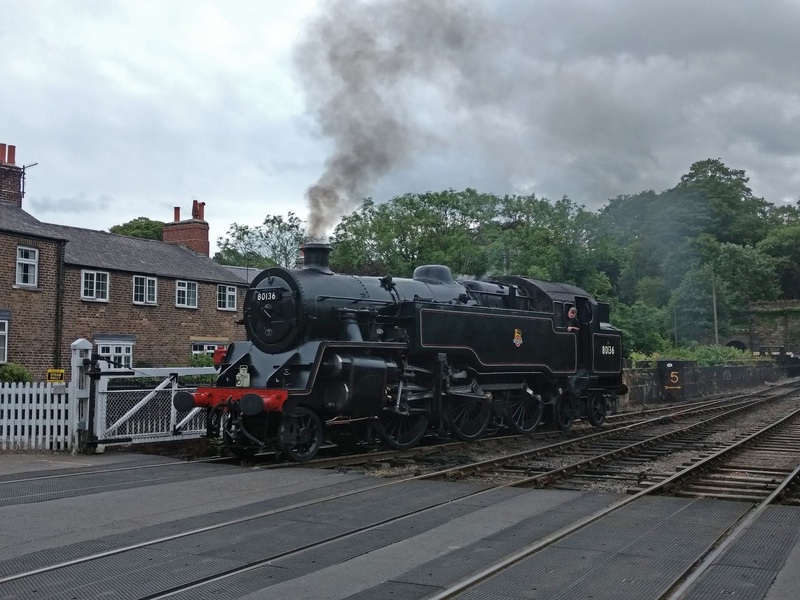 Before continuing northwards, REPTON paused to let B1 1264 into the station from the single line further down the Esk valley. 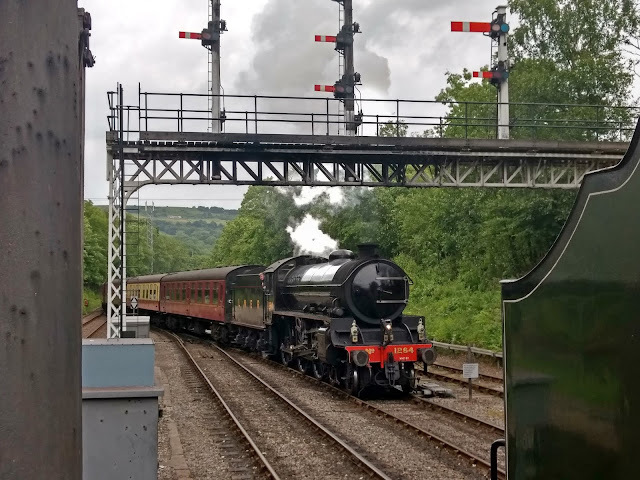 Staying behind at Grosmont, we took in the atmosphere and watched the two trains depart in opposite directions. 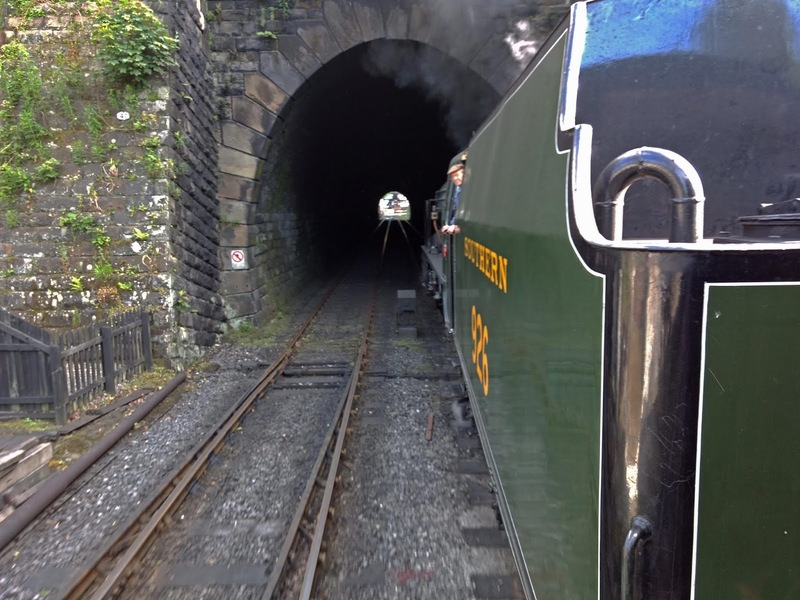 There was even time for a quick video of 1264's departure and on to the main running line through the tunnel. 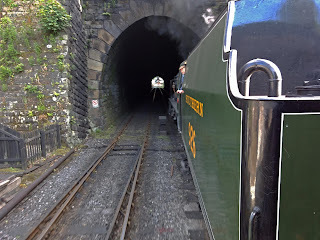 We went off through the smaller tunnel to find the loco shed behind it. Yorkshiremen are friendly, and on revealing our common railway preservation aims we were soon engaged in a lively conversation which resulted in an impromptu behind the scenes tour of the site. There were numerous locos being prepared for service, under repair or stored pending better days. Just like the real thing really. This coaled up but chimneyless Q6 for example, a heavy duty coal train slogger from 1913. 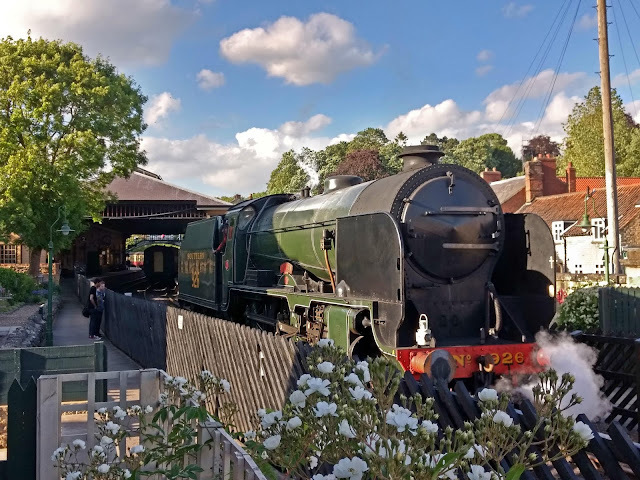 Others glimpsed were The Green Knight, Hartland, a Southern S15, 80136, Eric Treacy and sister engine to our 76077, BR 76079. 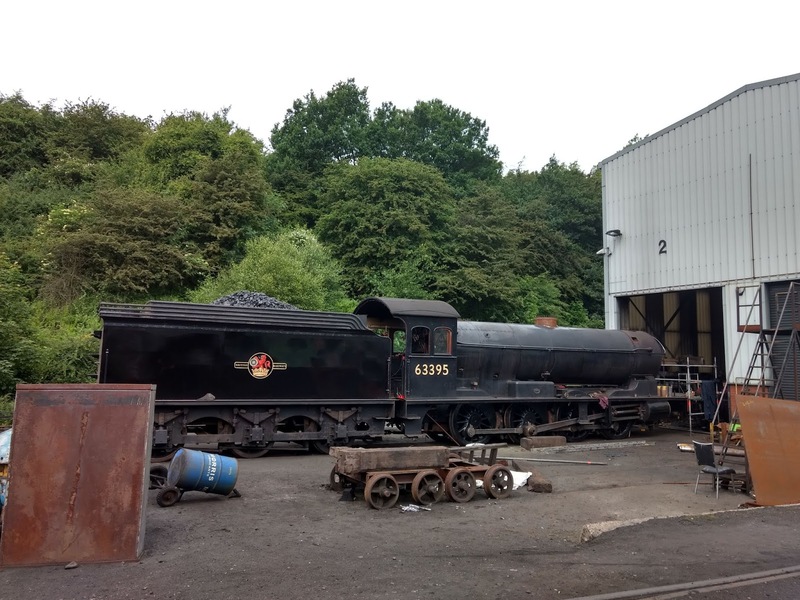 Black 5 Eric Treacy was near the end of the production line on a 7 year boiler service, already equipped with a fabulous black paint scheme. Look at the depth of that shine! Then we were shown the wheel drop, recovered from Hull Dairycoates and completely rebuilt in a new (and rather unattractive modern) shed. 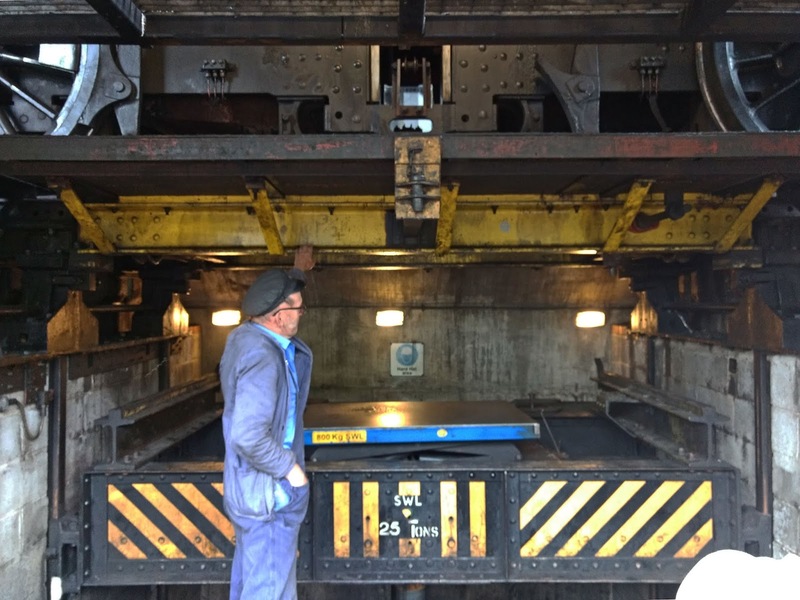 Complete axles can be removed from under the loco without lifting it, and removed to be stored to one side. Current customer, just visible above with an axle missing, is 76079 which developed a knock only on LH bends. Investigations are ongoing! 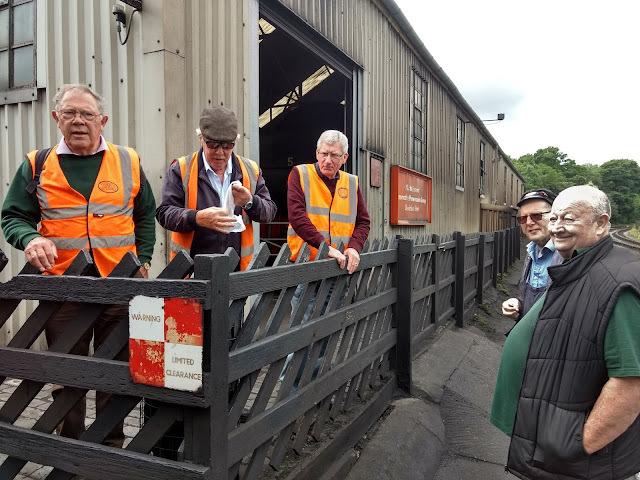 To our amazement our little sub group of 3 with the full shed tour met another GWSR sub party, fully kitted out in the orange they had brought all the way to the NYMR, but installed customer side behind a fence. There's justice for you. John M holds forth with a sad, moving story, which has brought tears to John R, who has got his hankie out. That same afternoon we were already due back in Birmingham again, far away but true. While waiting for our service train to Pickering we discovered that the Moorlander lunch train in the rear platform, comprising teak bodied, Pullman and GWR auto coaches, was also open to regular passengers in the rear two coaches. It was to be hauled by 80136, so we watched it couple up and then went to find the rear portion for public use. 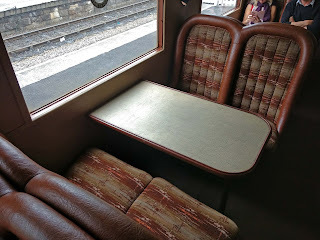 We found an LNER 1930s teak bodied third, a new experience for most of us. The decor was very unusual for us, with our unrelenting diet of Mk1s. Despite the third class there was a certain opulence about it, with thickly chromed fittings, mirrors, Rexine surfaces and these superb bucket seats. The ride seemed slightly harsher than a Mk1, and the track ranged from distinctly bumpy with dipped joints to perfectly smooth on recently relaid and completely new sections of track. 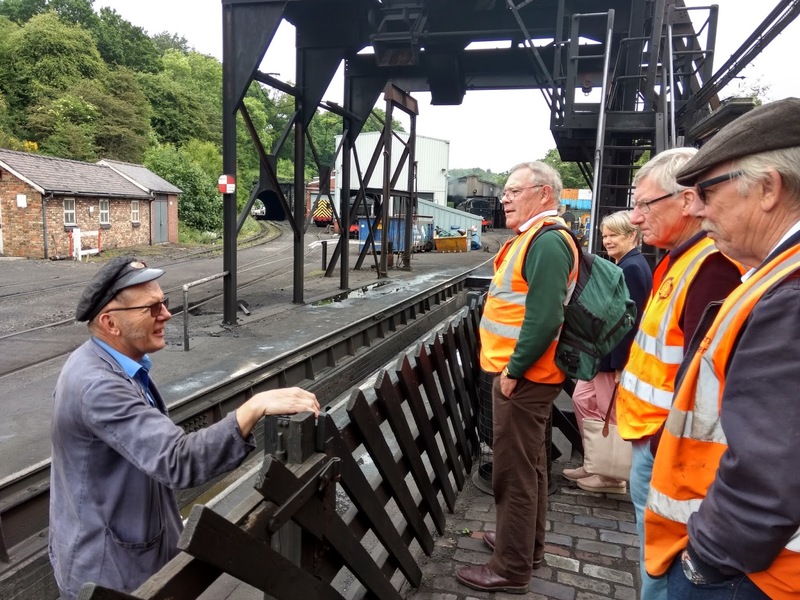 The NYMR's heavy track investment programme is well known to PWay people, especially its use of large capacity bogie Seacow hoppers brought in via the railway's main line connection. 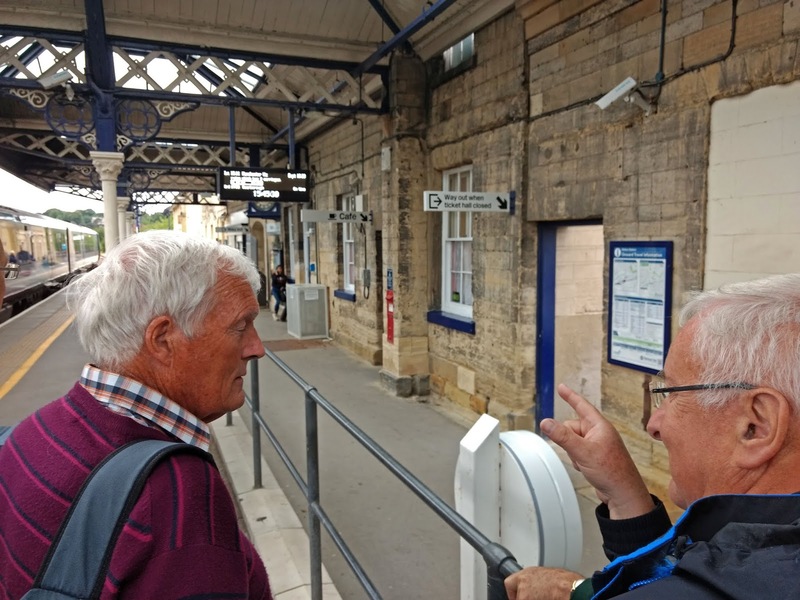 Safely back at Pickering and finding our rail link to Malton dismantled since 1966, we opted to take a bus connection from Eastgate. Here our group's travel plans split again. Having booked separately, the routes taken were once more completely different. 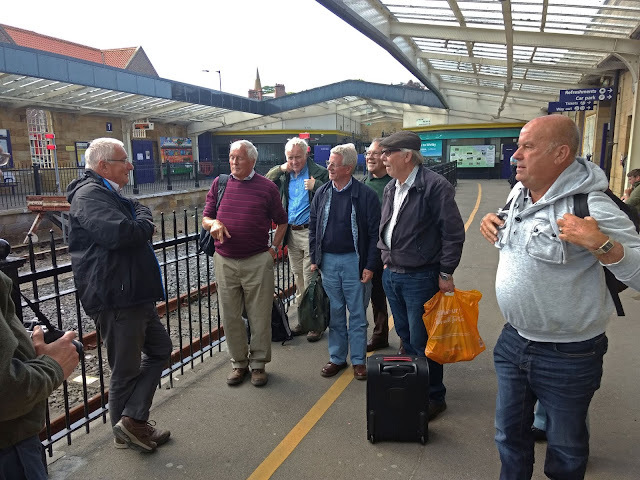 Both groups took the bus to Malton, where Peter, Robert and yours truly got off while the rest carried on to York to head south. Our little group of 3 was once again reduced to fretfully consulting our watches, as we had a train to catch at Malton! Although it only started 4 miles away, the bus failed to arrive on time. We waited and waited were on the point of abandoning everything, racing back to the station and taking an expensive taxi when the bus finally appeared - preceded by a horse and cart! We made Malton on time, to find a train (that was supposed to stop only briefly) terminated at the station. You needed to know (and Robert did) that Malton station used to have both up and down tracks (as well as a bay to Pickering) and even had an overall roof, taken down in 1989. Today it only had one platform, at which a train was parked, doors closed. This was an earlier train going the other way to Scarborough which had been terminated here, to form our (passing through) train at 16.11. So far so good for us. 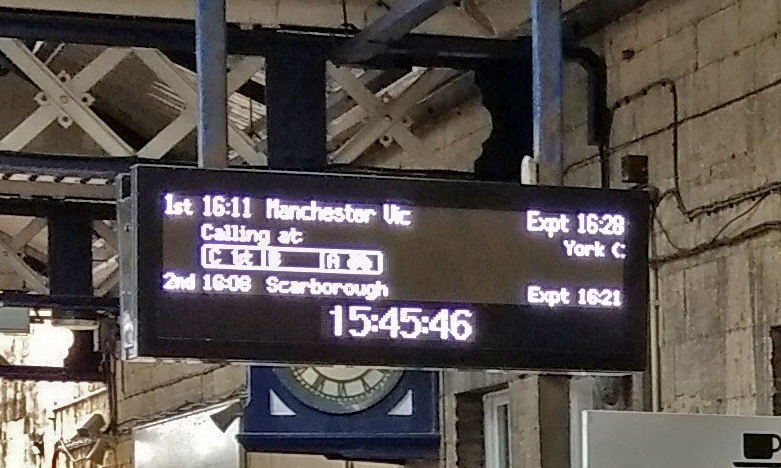 However, the destination board said 'expected 16.28' and the ticker tape running underneath showed adjusted times to all the stations along the line, including a late arrival for our onward connection at York. Disaster! And so early into our rail journey too. You could also work out from this board, knowing there was but a single line, that our train heading west was going to interfere with the 16.08 heading east, even if it did arrive at 16.21 as 'expected'. Our dastardly plan was to change at York, not to head south directly to Birmingham, but further west over the Pennines to Manchester. This roundabout saved £20 on the cost of the ticket, and was worth the extra adventure. 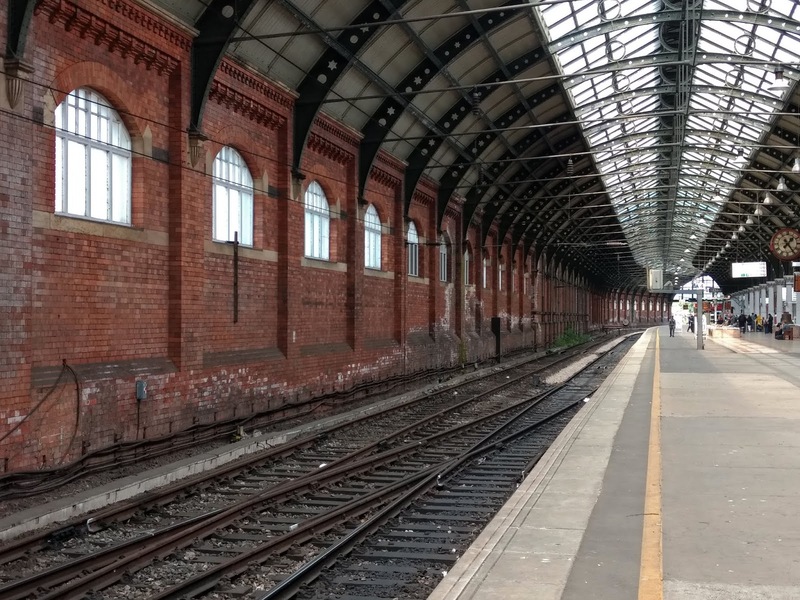 We needed to change to a Manchester Piccadilly train at York, whereas ours from Malton also headed to Manchester, but to its Victoria station on the other side of town. 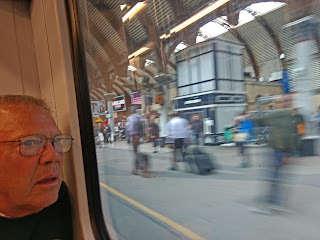 We were on time, but would our Piccadilly train be on time at York? If not, we would fail to connect with our Birmingham train at Piccadilly. This did not make for a relaxing journey. We asked the train manager for news of the Piccadilly train, but as it did not show up on his online directory he had to confess that it might have been cancelled. Via text messages with group 2 already at York by bus, we learned that our connection did exist, but was increasingly late. What to do? Get off at York as planned, and throw ourselves at the mercy of a delayed train to Piccadilly, or stay on the Victoria train, and find a way across Manchester with only a few minutes left? At this point a helpful, experienced Manchester commuter overheard our worried discussions and gave us her advice. Catch an airport train at Victoria (which stops at Piccadilly) or if there is none on time, take the tram across town. She would show us how. And she did too! Airport trains there were none of use to us, so it was the tram outside the station. We galloped across the tracks, to find that the next one on the branch to Ashton under Lyne would be too late to help us. As we stood dejected, another tram rolled in with a PICCADILLY destination blind. Really??? Yessss! We clambered on board to immense relief, and made our Cross Country train back to Birmingham, perfectly on time. What an adventure. Shall we try another trip next year? Yes, but will our nerves survive the experience? Rail travel in the UK is for the experienced, not for the faint hearted. Also Jo. That Sprinter that you refer as being used by group 2, is a pacer! 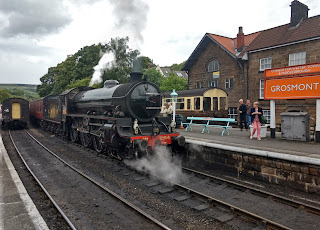 Hope you enjoyed your trip on the NYMR and are not too stressed. 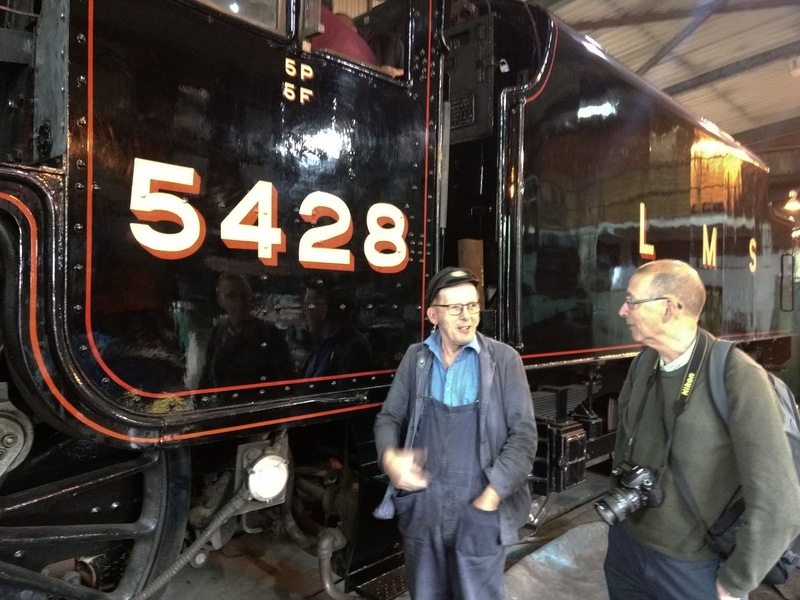 Thanks for a fascinating and entertaining blog from the travel correspondent of the GWSR. Interesting to compare the friendly, romantic,(technically detailed) surrounds of the NYMR with the chaos of modern day rail travel. If only that blog could find it’s way onto Chris Grayling’s desk. We have “Pacers” here in Wales on the Valley Lines. Lots of them! My daughter in law, who commutes into Cardiff, was told that her train would not be stopping at her station. To catch up time it would be going on to the terminus, 3 to 4 stations further on but, not to worry, would be stopping on the return! And then it was 5 minutes late! If I remember correctly it was "Repton" masquerading as "Cheltenham" that came to the GWSR when we opened the extension to CRC. Thanks for the interesting "blog" a very good read. Alfred Hitchcock presents..."Return to Whitby". Are destination boards only there to create dramatic tension and Mcguffins? Theres nothing quite like the helplessness of sitting on a delayed train outside a station and watching your connection go clattering past. Hope your heart rates have all returned to normal. All the best, Mark. Yes, sorry about the Sprinters, Pacers of course. I knew it had something to do with running. Vincent designed LNER Q6 0-8-0 63395 entered service at Blaydon in December 1918 & was withdrawn on 9th September 1967 at Sunderland, after 48 years, 9 months & 10 days. It has been in preservation for longer than that. It's astonishing! However the Robinson designed LNER Class O4 2-8-0 63601 was built at Gorton in 1912 & was withdrawn from service on the Great Central on 24th June 2012 & is awaiting overhaul. When I joined the NCB on 1st January 1962 as a lowly grade 2 clerk, I was recommended to attend night school, in order to gain promotion. During 1963 &1964 I studied for my City & Guilds in “Solid Fuel: Production, Distribution & Utilisation, Parts 1 & 2, (a qualification no longer taught). I learned that even with a thermal efficiency of <8% for a steam locomotive, it was cheaper haul coal 100 miles & burn it in a local power station near the point of use than generate electricity near the coal mine & distribute electricity 100 miles over the National Grid (as was) with the attendant transmission losses. The lecturer really caught my attention when he held up a piece of coal & explained that 1lb of coal when burned in the firebox of a goods steam locomotive, could generate sufficient steam to haul 100 tons 1 mile. In those days of unfitted freights, an 0-8-0 goods locomotive weighing 80 tons would chunter along at an average 25 mph with 500 tons on the drawbar. Unsurprisingly, that would explain the longevity of these locomotives. As someone who travels all over Europe for business you’re basically demonstrating why I switch from train to car if a journey in the UK involves more than one change. You need physic powers to know what’s going on, I once had the board change on a train 3 times when I was in Reading. Never again. It’s fine for people who only do one route but no good for people like me.